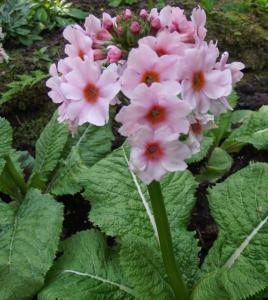 Primula japonica 'Apple Blossom' is a deciduous perennial with pale green, wrinkled, rounded leaves, the plant forming atypical rosette. In late spring and early summer, 2-6 tiered whorls of flowers are borne on stems about 45cm tall. The pale pink flowers have a darker reddish-pink centre and are perhaps the nicest in this group of perennial. A deciduous hardy perennial requiring a damp soil is sun or part shade. The Candelabra Primulas (the Proliferae section) are exceptional plants,originating from Western China and the Himalaya, for woodland, damp or even very wet places. They make clumps of strong leaves, deciduous in some species and persisting through the winter in others, and then send up their tall flowering stems.At intervals up the stems there are whorls of ten or more flowers, each ring opening one after the other every week or so. In some species there can be up to seven whorls that gives an exceptional flowering period. Colours range within the species from brilliant orange or yellow, red, pink, white, even dark maroon.